We offer twelve free printable Birthday templates to customize and print in just moments. These customizable Birthday party templates are the easiest way to get ready for your party without the wait of using a printing service. Get some heavier high quality paper and put your own printer to work, then simply send like a postcard! Update the titles, and text and even add an optional picture to one of the free Birthday party invitations. Enjoy a variety of colors of all the Birthday Invite Templates to suite a girl or boy themed Birthday. Select the free printable/customizable Birthday invitation of your choice below. You can customize these certificates in Adobe just like you would any document in Microsoft Word. 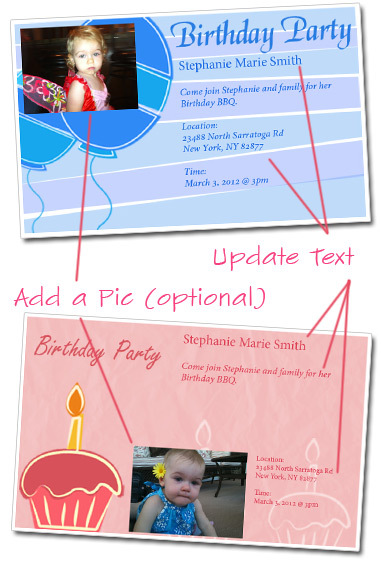 Make the updates to the Birthday Invitation as shown in the diagram at the top of this page. Although there is text that guides you where to click to place the picture, if you select to not add a picture, this text won't print (even though it shows on your computer screen). When completed, make several copies of your Birthday Invitations as you will not be able to save your changes unless you have the professional version of Adobe Acrobat.